Treat the man in your life to a pair of these beautifully personalised cufflinks, printed with photos or classic initials. Design each one individually and add some personality to your formal attire or workwear. Your metal photo cufflinks are available in square or round and come in a smart, gift-ready presentation box. This pair of smart and sophisticated personalised cufflinks are a gorgeous gift for the men in your life. Choose from round or square, and print a precious photo or quirky design to brighten up their outfit. Photo cufflinks, UK made and printed really add a special touch to formal attire, and they're a unique keepsake for years to come. Made from a rustic, silver coloured, worn metal with a hinged toggle for fastening, you can certainly dress to impress. Sold as a setof two. Quick, good quality and accurate! Really pleased with these photo-upload cufflinks. I was worried about how the print quality would be and whether they'd be centred (as I was uploading a logo that needs to look crisp). But I'm really pleased on both counts, the print quality is great and they're bang-on centred. The original cuff links had cut off part of the picture, however they sorted them out eventually for us. Like many of our products, the pair of personalised cufflinks come with a quantity discount, saving you money the more you buy. This is ideal if you're buying pairs for all the groomsmen at your wedding, a suave stag do or all the men in your family. We print your photos onto a glossy surface within the pair of round or square cufflinks. Your designs won't peel over time or scratch off, as we use a specialist technique that creates a long lasting print. They're hand finished to an exquisite quality, ensuring your recipient will fall straight in love with their new stylish accessory. As each item is bespoke and handmade to order, the post and toggle clasp may vary slightly in shape and size, this will not impact the overall look of your cufflinks, or affect their usage. The actual printable area is very small, measuring only 18 mm diameter or 15 mm square. Images that are extremely wide in nature will be difficult to scale to proportion, so please use the design interface to view and edit your design. A popular way to decorate your pair of cufflinks is with initials on a colourful background. This is a sleek and smart design that is perfect for both work and play. You could even go for the double initial style and give them an engraved effect. Treat your dad to a special pair of Christmas cufflinks, personalised with funny photos from past festivities. It can become a family tradition that he wears them on Christmas day, or the whole holiday period, to help spread the festive cheer. Great for a new dad present, you could make them "To Daddy" from the baby, or for an older children's gift "For Dad". Custom made with your design inside the print area, the perfect men's gift for the best dad. If your partner has recently got a new job, a cool pair of cufflinks personalised with their initials is the perfect gift to say congratulations. It will help make a lasting professional impression and shows that they mean business. As a super sentimental gift for your loved one, design a pair of photo cufflinks using part of a map image to indicate where you first met. Whether this was abroad, or in your local town. It's a cute idea that looks incredibly sophisticated but also a sweet keepsake too, making a perfect idea for a groom, or groom-to-be, or for that special someone. If you are getting married, a personalised pair of cufflinks makes a wonderful gift for the father of the bride. Everyone considers the maid of honour, and the best man, however, the father of the bride can often be difficult. 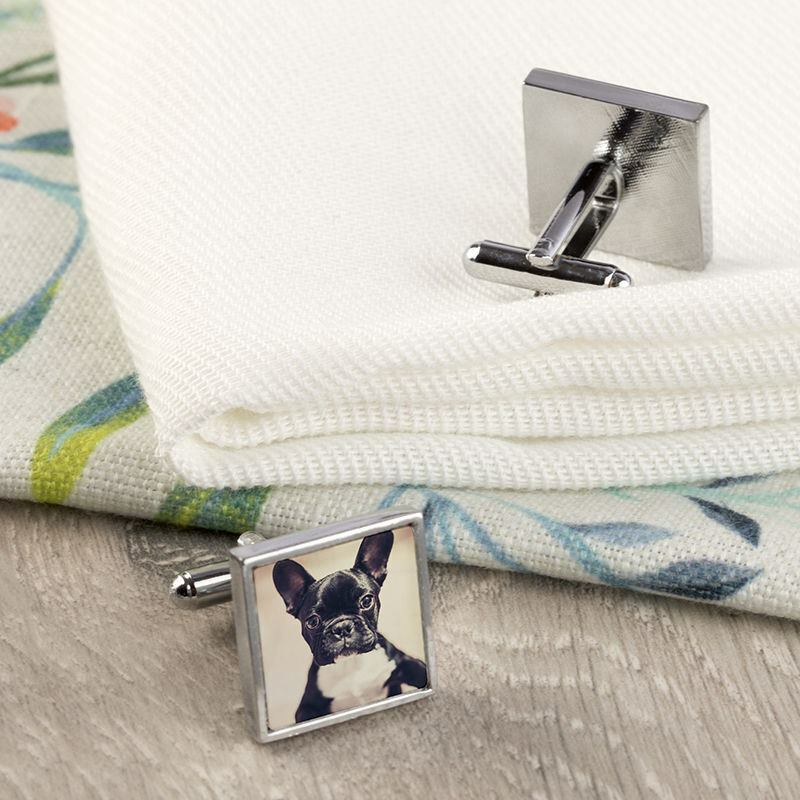 A pair of custom cufflinks would make a wonderfully sentimental memento. Design your own tie. Custom ties made same day printed front and back. It's not silk but it's great and you can design it. Personalised leather belts made with your favourite designs or photos. Silver look metal buckles. Custom belts made in UK. Design your own wallet with your favourite memories. Choose from real leather or oilcloth.